Kristen has been a secretary for two years, and she's about ready to get that raise! Let's see if she can put away some more money to pay off her student loans . . . or buy a new car! Love ebbs and flows with the tide. It's totally correct that you need to be ready for whatever the world throws at you, and you should know that if you're ready then your love will survive anything! 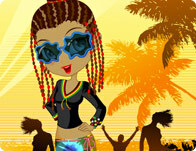 Here is your chance to dress up in a reggae style. The metal drums are clanging and the people are dancing and the party is bumping. Get your dreads and your tye-dye for a jamming reggae party!